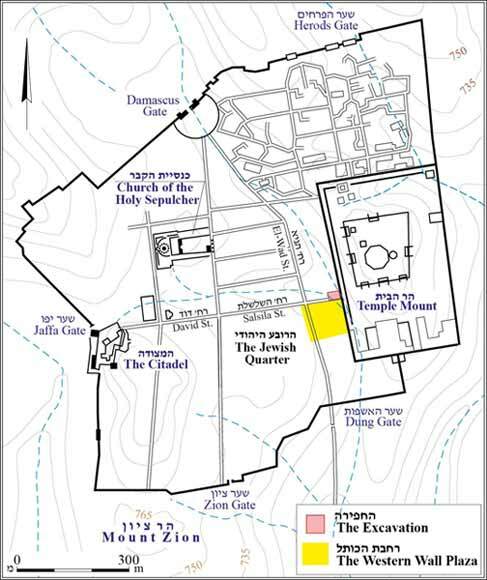 In 2010–2012, another excavation season was conducted in the cavities beneath the Great Causeway, extending between the Temple Mount and Ha-Gay Street (Permit Nos. A-6085, A-6393). The excavations, undertaken on behalf of the Israel Antiquities Authority and at the initiative of and with financing from the Western Wall Heritage Foundation, were directed by the late A. Onn, with the assistance of Y. Rapuano (area supervision), A. Peretz (field photography), V. Essman and Y. Shmidov (surveying), D. Tanami (metal detector), N. Zak and E. Belashov (drafting), S. Weksler-Bdolah, J. Patrich and O. Peleg-Barkat (architecture and stratigraphy), D.T. Ariel (numismatics), J. Gaertner (Roman-period pottery), P. Reuven (Byzantine- and Islamic-period pottery), N. Katsnelson (glass), J. Bukengolts (pottery restoration), A. Karasik (digital photography) and M. Goodin (pottery drawing). Following Alexander Onn’s untimely passing in 2012, S. Weksler-Bdolah assumed responsibility for the preparation of a final report for publication (for an article summarizing some of the finds described below see Onn and Weksler-Bdolah 2011; Onn, Weksler-Bdolah and Patrich 2016). This excavation is a continuation of the extensive excavations conducted in the cavities beneath the Great Causeway since 2007 (Onn, Weksler-Bdolah and Bar-Nathan 2011; Figs. 1, 2). The Great Causeway is a Roman-period arched bridge that crosses the Tyropoeon Valley near its confluence with the transversal valley. The bridge extends along a southwest–northeast axis (Fig. 2). In the past, the pavement of a Roman road that apparently led to the Temple Mount was discovered on top of the bridge. The Roman bridge was founded on top of a wide dam wall and a monumental structure, both from the Second Temple period. In its current form (length c. 100 m, width 10.8–11.0 m), the Great Causeway stretches between the Temple Mount and the Ha-Gay Street tunnel. The structure of the bridge includes Wilson’s Arch next to the Temple Mount, and its continuation to the west of Wilson's arch, which includes two adjacent rows—northern and southern—of narrower vaults. These vaults are built above the wide dam wall and buildings from the Second Temple period (for a detailed description, see Onn, Weksler-Bdolah and Bar-Nathan 2011: Description of the ‘Great Causeway’). 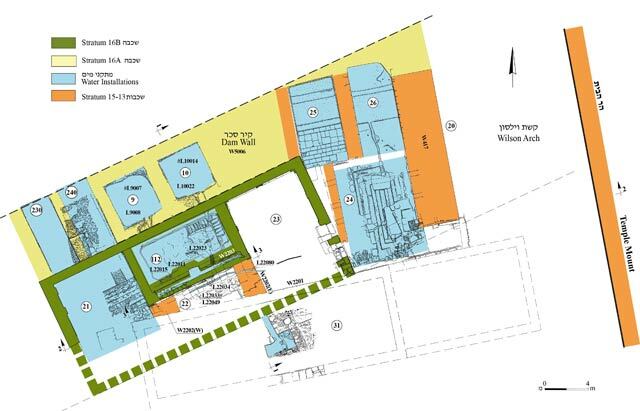 This season, the areas that were excavated included Vaults 9 and 10 (Rooms 9 and 10 below) in the Great Causeway and the Secret Passage to the south of Rooms 9 and 10 (Area 13), as well as Room 22 and Water Reservoir 112 (Figs. 2–5), which are situated on a lower level, below them. Sixteen archaeological strata were identified in the previous excavation season (Onn, Weksler-Bdolah and Bar-Nathan 2011).The finds revealed during this season will be described according to their ascription to these strata, with slight changes based on clarifications arrived at during the present season of excavations. The most ancient remains that were discovered are related to a monumental building from the time of King Herod (Building B; Figs. 2; 3:21–23, 112; 4; 5; Onn, Weksler-Bdolah and Bar-Nathan 2011. The structure seems to have been constructed south of the street that led to the western gate in the pre-Herodian Temple Mount wall (Kiponos Gate). , This street was later raised onto a foundation wall of cast concrete (built of opus caementicium [Roman cement]; below, W5006). In the past, Monumental Building B and Foundation Wall 5006 were ascribed to Stratum 16. Monumental Building B (internal dimensions: length 24.5 m, width 10–11 m) included two halls (21, 23), with a built water reservoir (112) and a fountain (22) that protruded to the south situated between them. The building’s eastern hall (23) was first discovered by Warren in the late nineteenth century CE and was known as the ‘Masonic Hall’ (Wilson1880; Warren and Conder 1884). This hall was studied again by Stinespring (1967), Ben-Dov (1982:178–180) and Bahat and Meir (Bahat 2013:113–128) in the twentieth century and has been referred to as the ‘Hasmonean Hall’ or the ‘Herodian Hall’. In 2007–2008, Onn exposed the structure’s western hall (21; Onn, Weksler-Bdolah and Bar-Nathan 2011: Hall 21), and in the current excavation, the central part of the building was exposed. This part includes a water reservoir (112) and a fountain (22), which was initially identified as a nympheon (Onn and Weksler-Bdolah 2011; Stiebel 2013). 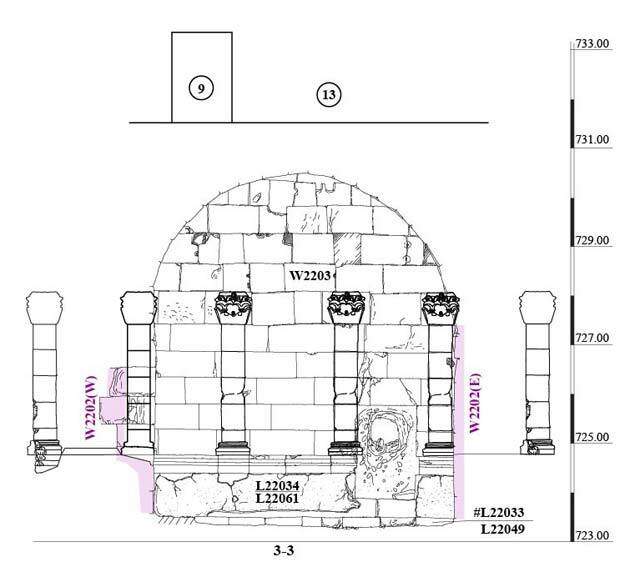 Recently, however, we have suggested reconstructing the building as a complex Herodian triclinium with a fountain in its center (Onn, Weksler-Bdolah and Patrich 2016; Patrich and Weksler-Bdolah 2016). The entrance to the building was in the southern part of the eastern wall in Hall 23. The building’s walls facing the interior were built of ashlars, and their bottom parts were decorated with a protruding cornice, whose top was c. 1.25 m above the floor. Protruding from the walls above the cornice were flat square pilasters bearing Corinthian capitals with smooth leaves, and square recesses above them were used to secure the roof beams (Fig. 6). The Fountain. The fountain wall (W2203; exposed length 6 m, full length c. 10.5 m, height c. 7 m; Figs. 3, 6–8) in Room 22, in the center of the monumental building, extended east–west and separated Reservoir 112 in the north from Room 22 in the south. Two additional stone courses were preserved above it. The face of these courses was set back slightly as compared to that of the wall below, and the courses constituted part of the building’s upper story. The surface of the wall facing south was decorated on the bottom part, similar to the walls of Hall 23, with a prominent cornice; six pilasters were fashioned above it, three of them were exposed in the excavation. At the top of each pilaster was a Corinthian capital equipped with a central hole (diam. c. 5 cm; Fig. 9) from which water was probably conveyed in lead pipes. The area was examined with a metal detector, revealing a lead pipe extending the entire length of the wall in which there were six openings that distributed water. The pipe stretched from the western end to the eastern end, for the entire length of the fountain wall and was fixed within the wall at the level of the openings in the center of the Corinthian capitals. Square recesses for securing the roof beams (one recess above each capital) and the top of the fountain wall, preserved to a height of 2 m above these recesses, indicate that the area of the fountain was covered with a flat roof and had an upper story, perhaps an observation deck. At some point, gray hydraulic plaster was applied to the entire length of the fountain wall podium (below the protruding cornice; L22061). The possibility that the plaster was connected to a narrow draw basin (width 1 m) situated at the front of the fountain was examined. This basin was also inspected to ascertain if a stone railing belonged to it. The railing, which was an upright stone slab with a rounded edge, was preserved c. 1 m south and parallel to the fountain wall; it was partly sealed beneath the western wall that supported Vault 2202 (height 1.2 m, thickness 0.4 m, length unknown). However, the possibility of a draw basin was negated for the following reasons: 1) little of the plaster on the wall of the podium continued until the western end, thus cancelling any possibility of the existence of a wall perpendicular to the fountain’s podium, which enclosed the presumed pool on the west; 2) The bottom of the pool and the inside face of the stone railing were not plastered, and the finish of the inside face of the railing was incomplete. In such a fine building, one would expect the railing to be properly finished. It is likely that this stone railing was ex situ. Therefore, in the absence of any evidence of a draw basin in front of the fountain, the hypothesis is that the water from the fountain poured into portable stone basins that were placed on the floor of the hall (L22033), at the foot of the water outlets. Excess water that flowed onto the floor was drained in a shallow slightly circuitous channel, which was hewn in the pavement stones. The channel extended along the fountain wall from west to east and beyond it; the eastern end of the channel was preserved and is now visible in Hall 23 (L22080, preserved length c. 7 m, width 0.10–0.15 m, max. depth 0.1 m; Figs. 7, 8). Fountains with water flowing from openings fixed high in their walls are known from paintings on Greek jugs (Glaser 2000:414–416), showing water depicted flowing from the mouths of animal heads that were set in the wall, and girls, filling the jugs directly from the stream of water flowing from the fountain. In the fountain exposed in the excavation, the water came out of the Corinthian capitals fixed in the tops of the pilasters. Two installations that were most likely related to the operation of the fountain were integrated inside the core of the fountain’s wall (W2203, width 1.4 m): a narrow plastered channel (L22015, length 8.5 m, width 0.5 m, height 1 m, Figs. 3, 4) and a square vertical shaft (L22011, 1 × 1 m, 5.5 m, Fig. 3) in the center of the wall above the channel’s top. Thin lead pipes were incorporated in the northern side of the vertical shaft, between it and Reservoir 112. Another lead pipe (diam. c. 15 cm, length in excess of 1 m), with a filter at its northern end, extended from north to south, from the bottom of Reservoir 112 toward Channel 22015 (it was not possible to see the connection between them because of a later breach, below). The lead pipe was probably related to the operation of the fountain. The water supply to the fountain and how it operated are still being studied. The Water Reservoir. A closed rectangular water reservoir covered with a barrel vault aligned along an east–west axis (Room 112, 4 × 8 m, height 6 m; Figs. 3, 4, 10) was installed north of the fountain wall (W2203), between it and Hall 21 in the west and Hall 23 in the east. The walls of the reservoir were built of ashlars set in place on a foundation of poured concrete whose elevation here was c. 1 m higher than its elevation below the floor of the fountain (opus caementicium below the reservoir: L22046, opus caementicium below the floor of the fountain: L22049; Fig. 4). This was apparently due to reasons related to water pressure. Several layers of plaster that were applied between the Herodian period and the Roman or Byzantine periods were preserved on the walls and bottom of the reservoir. A narrow staircase (width c. 0.8 m) built inside the reservoir descended from the top of the installation in the southeastern corner, along the eastern and northern walls, to the bottom of the installation. A thick layer of plaster (from Stratum 7 or 8) that covered the walls of the reservoir (112) sealed and covered the lead pipes that protruded from the face of the aforementioned vertical shaft (L22011). At one point, a large rectangular opening was breached in the eastern part of the fountain’s wall (W2203; width 1.2 m, height 1.9 m; Figs. 6–8), which damaged the front of the fountain’s wall and severed Channel 22015 inside the wall. The side of Reservoir 112 (thickness 0.4 m, including the plaster layers), north of the opening, remained complete and was breached during the current excavation. The absence of a threshold stone or lintel leads us to surmise that the opening did not serve as an entrance, and may have been intended for the placement of something, possibly a rectangular installation that was the size of the breach. The wide lead pipe described above was discovered in situ in the foundation of the opening. The pipe may have been related to the operation of the fountain or an installation inside the rectangular opening. It was not possible to determine exactly when and why the fountain wall (W2203) was breached. The finely crafted shape of the opening corroborates its attribution to the Second Temple period, a time when the building was still in use. Sometime after the monumental building was constructed, the level of the road leading to the Temple Mount was raised by constructing a large massive wall that presumably carried on it the elevated road. The wide wall (referred to as the ‘foundation wall’ or the ‘dam wall’ W5006 in previous publications; Figs. 2–4) was built up against the northern wall of the monumental building and concealed its facade. The wall was constructed using opus caementicium—boulders and variously sized fieldstones bonded with very hard mortar. Its known length is c. 70 m—from the axis of Ha-Gay Street in the west, where it was documented in the past (Hamilton 1933:334, 36) until Room 10 of the Great Causeway in the east (below)—and it is 14 m wide west of and c. 6 m wide north of the monumental building (Onn, Weksler-Bdolah and Bar-Nathan 2011: Foundation Wall W5006; Building A). The wall extends from the southwest to the northeast, perpendicular to the axis of the Tyropoeon Valley. Its continuation east of the monumental building is still unknown. In the current excavation, the top of the foundation wall (W5006) was discovered in Rooms 9 and 10 (North), north of Reservoir 112 of the monumental building, and its top elevation there (c. 730 m asl) corresponds to the elevation inside Room 8 (North), north of Hall 21 in the monumental building (Onn, Weksler-Bdolah and Bar-Nathan 2011; Fig. 2). Two elongated vaults (Figs. 3, 5:230, 240) that were partially excavated were incorporated in the dam wall inside the core of the wall, below Room 8 (North) of the Great Causeway. The tops of the vaults were at elevation c. 726 m asl, and Roman concrete was cast (height 4 m) above them. In the past, we proposed that W5006 carried an elevated road that led to Kiponos Gate—the western gate in the pre-Herodian Temple Mount wall. Wall 5006 presumably crossed the Tyropoeon channel and therefore was identified as a dam wall (Onn and Weksler-Bdolah 2011:112; for a reconstruction of the road see Onn, Weksler-Bdolah and Bar-Nathan 2011, Fig. 6). The new finds, indicating that W5006 was built slightly later than the monumental building, raise the possibility that Foundation Wall 5006 is related to the Herodian expansion of the Temple Mount and to the installation of a new road that would lead toward the Herodian gate, which was constructed above Wilson’s Arch (in Stratum 15). At this juncture, it is impossible to decide which of the two alternatives is correct. Major changes occurred in the buildings during these phases. The magnificent building’s interior was divided into three separate spaces, each covered by a vault, in which water installations were constructed (Fig. 3:21–23). It is impossible to date the construction phases that occurred one after the other in the late Second Temple period, prior to 70 CE, with precision. 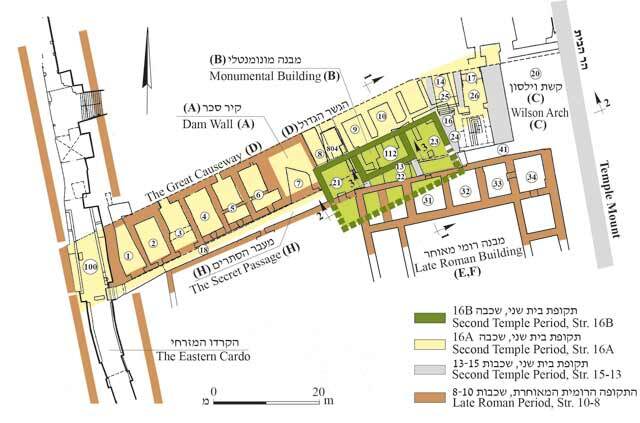 It seems that the changes are connected to the expansion of the Herodian Temple Mount and the building of Wilson’s Arch, as well as the Great Revolt in 66–70 CE (see also Onn, Weksler-Bdolah and Bar-Nathan 2011). The Dam Wall and the Monumental Building. In front of the wall of the fountain (W2203), which no longer operated at this point (the rectangular opening from the previous phase damaged the fountain), a vault (W2202) was constructed that now sealed Room 22 (length 1.8–3.0 m, inner width 6 m, height above floor level 6.5 m). Its southern part was damaged by the later Roman building. The walls bearing the vault were founded on the stone slab pavement (L22033), or on a base of opus caementicium in the pavement’s foundation (L22049). A thin curved line—preparation for the construction of Vault 2202 (Fig. 11)—was engraved in the face of W2203. 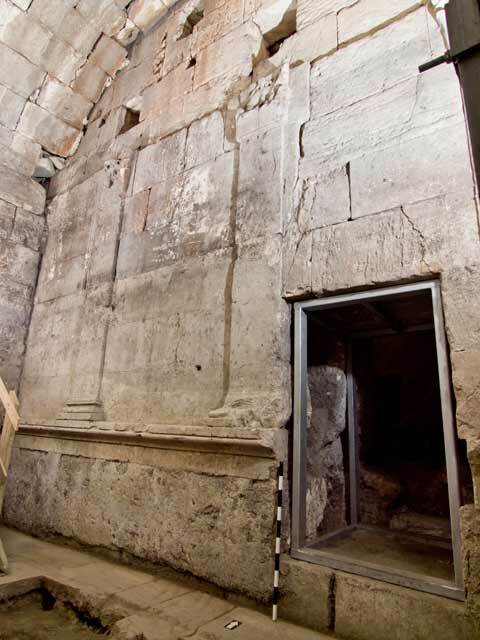 The vault, which rested on the northern edge of W2203, did not take the pilasters or the fountain openings into account; it sealed and obscured three pilasters and blocked the shallow drainage channel that was hewn in the pavement of the building along the fountain wall (L22080). An installation treated with gray hydraulic plaster was installed inside Room 22. Apparently, this was a pool, the complete shape of which is unknown (L22034). The plaster on the pool covered the podium wall (W2203) with a second layer of plaster (above the plaster in L22061; Fig. 6), and it probably also covered the installation that was incorporated in the breached opening (above). Plaster (L22034) was also applied to the stone pavement (L22033) at the front of the podium wall, and it blocked and filled Channel 22080. The plaster broke when the installation was removed in a later phase (Fig. 6). A small section of plaster revealed (L22034) in the northwestern corner of Room 22 extended up from the pavement of the room on the podium of the fountain wall (W2203) and on the wall bearing the western wall of the roof vault (W2202). It seems that the pool stretched the entire width of Room 22; its length is unknown. A coin dating to the reign of Nero (58/59 CE) was discovered inside the plaster (L22034). A large ritual bath (miqveh) was also installed inside Room 21 at this time (after 59 CE) and two coins dating to this period were discovered in its foundation (see Onn, Weksler-Bdolah and Bar-Nathan 2011, L20059). Two square pools (each c. 4 × 4 m; depth c. 1.5 m) were hewn in the top of the dam wall (W5006), north and outside of the magnificent building; one was found inside Room 9 (North) of the Great Causeway (L9008) and the other inside Room 10 (North) of the causeway (L10022; Figs. 3:9, 10; 4: L10022 in Room 10). The pools were somewhat carelessly hewn and their corners were not perpendicular. They were treated with a thick application of light brown-gray hydraulic plaster that covered their bottom and walls. The vaults of the northern bridge (9 and 10) of the Great Causeway were constructed above the pools (Fig. 4). Soil that accumulated on the bottom of the pool in Room 10 yielded fragments of pottery vessels from the Second Temple period (first century CE) and the Late Roman period (second–third centuries CE; the time of Aelia Capitolina). It was not possible to ascertain if the pools were installed in the late Second Temple period or in the Late Roman period. During this period, Vaults 9 and 10 in the Great Causeway (Fig. 2) were constructed above the tops of the dam wall (W5006). The Great Causeway (‘Giant Viaduct’) is a long arch bridge (length c. 100 m) that extends between the Temple Mount in the east and the Eastern Cardo in the west, and includes the monumental Wilson’s Arch that is incorporated in the Herodian courses of the Temple Mount, and west of it two rows of arches, in the north and south, that were built one after the other. The northern row of arches was erected first and was used for a narrow bridge between the Temple Mount and the Western Hill, and later the narrow bridge was made wider with the addition of another row of arches to the south and a road was paved on top of the widened bridge that led to the Temple Mount (for the history of research on the building see (Onn, Weksler-Bdolah and Bar-Nathan 2011). The vaults of the northern row, in which excavations are currently being conducted (Fig. 2:9, 10), were already known in the nineteenth century, and after 1967, some of the vaults were cleared of the soil fill that had accumulated inside them and a passage was prepared through them. The current excavation in the vaults began at elevation c. 731.50 m asl and reached a depth of c. 3 m. Vaults 9 and 10 were founded on the top of the dam wall. They were built above the rock-hewn pools (L9008 and L10022 respectively) but are c. 1 m longer than the pools to the south (length of the vaults from north to south c. 5 m, length of the pools c. 4 m). The common pillar shared by Vaults 9 and 10 was founded on the plastered partition that separates the two pools. 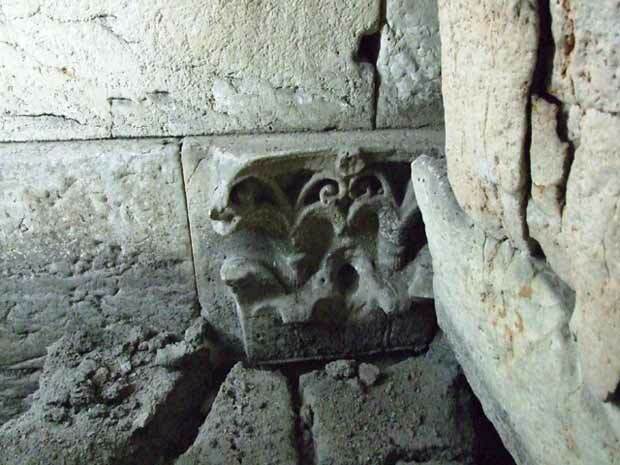 The plaster of the pools did not continue from the pools’ sides to the vault’s pillars. The accumulation of soil above the bottom of the pool (L10022) in Room 10, which yielded body fragments of vessels from the Early Roman and Late Roman periods (until the second–third centuries CE), was sealed beneath a Byzantine stone pavement (Stratum 7, below). Like the northern vaults in Rooms 5, 6, and 8 (Fig. 2), where excavations were previously conducted (Onn, Weksler-Bdolah and Bar-Nathan 2011), the northern vaults in Rooms 9 and 10 are part of the northern row of arches of the Great Causeway. Their construction was also dated to the Roman period. The northern row of arches was probably built as a narrow bridge in the years 70–130 CE, in order to provide easy access to the Temple Mount from the army camp that was presumably situated on Jerusalem’s southwestern hill (Weksler-Bdolah 2014). The southern row of arches was built next to the northern row a while later. The flagstones of a street that was identified as the decamanus in the Roman city Aelia Capitolina were discovered on top of both bridges (Abu Riya 1992; Gershuny 1992; Kogan-Zehavi 1997). No finds were discovered that enabled us to determine exactly when the southern vaults were constructed. The row of southern arches in Rooms 9 and 10 were founded on the roof vault of Reservoir 112 from the Second Temple period, and they postdate it (W1002; Fig. 4). In the past, we suggested that the southern row of arches be dated to the time of Aelia Capitolina (Onn, Weksler-Bdolah and Bar-Nathan 2011). The Monumental Building. The Herodian paving stones were plundered in the southern part of Room 22 and the foundation of the monumental building (made of opus caementicium) was exposed. On it were fragments of a tabun and several nearby coins, the latest of which was minted during the reign of Vespasian (79–81 CE, IAA No. 138650). It seems that the remains of the Herodian building were dismantled shortly after 70 CE. During this period, a large structure that sealed the current excavation area in the south (E, F; Fig. 2) was constructed south of the Great Causeway and the monumental building. The building’s northern wall (W2201; Fig. 3) was preserved to an overall height of more than 10 m above a protruding foundation. Building E was partially excavated in the past and it was ascertained that the structure consisted of at least two stories. A Roman latrine was installed on the ground floor (Onn, Weksler-Bdolah and Bar-Nathan 2011, Room 31, Building E, F; Bahat 2013: L334, L554, pp. 163–186, Plan 6.06, Fig. 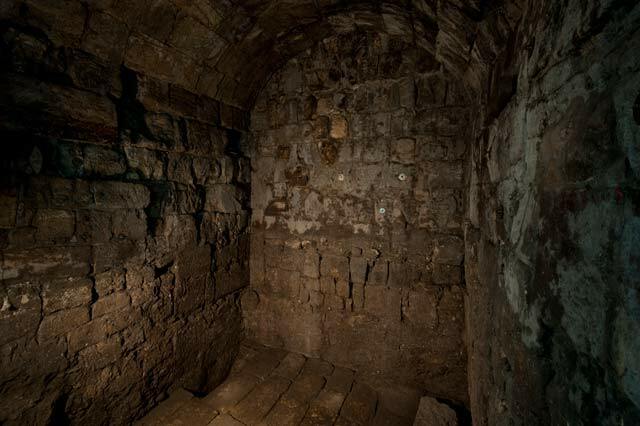 6.21), and a proper opening in W2201—an entrance from the secret passageway into the building—was indicative of an upper floor that existed at the level of the secret passage. The floor of the upper story was not preserved. 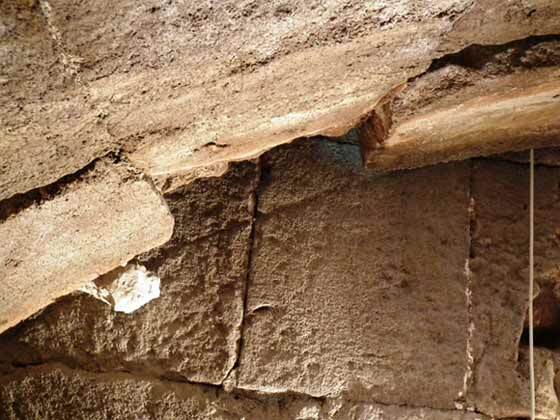 The excavation revealed that the construction of W2201 damaged the roof vault (W2202) from the Second Temple period, and therefore, the wall postdates it. The top of the southern part of Vault 2202 was repaired. Fragments of a thin white plaster floor and a narrow shallow drainage channel incorporated in it were exposed in Area 13 (the Secret Passage), above the top of Vault 2202. The channel, which extended along W2201, was built of fieldstones and was plastered and covered with stone slabs. Room 22. The construction of W2201 created a small closed space beneath Vault 2202, bounded by W2203 in the north, W2201 in the south, and the walls bearing Vault 2202 in the east and west. It seems that the breaching of narrow openings in the eastern and western load-bearing walls of Vault 2202, which made it possible to pass between Rooms 21, 22 and 23, should be ascribed to this phase. 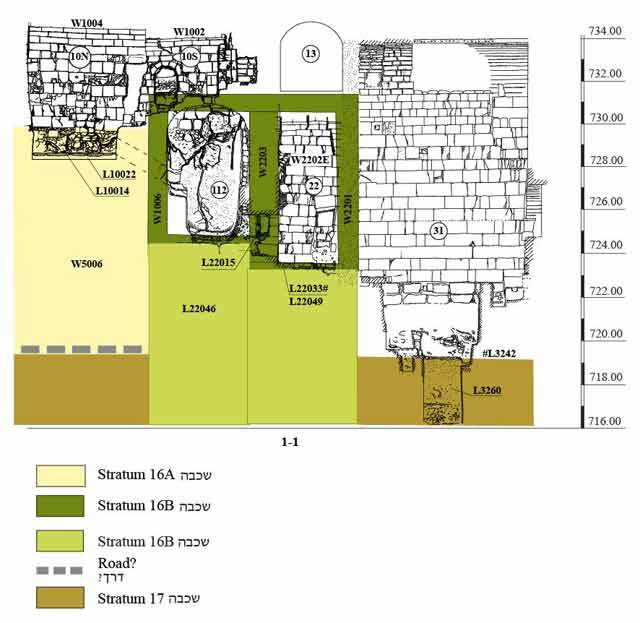 Inside Room 22 was a soil accumulation (thickness 0.5–0.6 m) above the opus caementicium foundation (L22049), a stone pavement (L22033) and the plaster of pool L22034 (of Strata 13–16). In the western part of the room, above the soil, a fragment of a pavement made of small stone slabs was preserved that was overlain with earth and collapsed stones. Rooms 9 and 10. A new pavement was installed inside the two square pools (L9008, L10022; Fig. 3). The pavement was made of square stone slabs, some of which were in secondary use (L9007 in Room 9, L10014 in Room 10; Figs. 3, 4, 12). Most of the paving stones had smooth surfaces and some were notched with parallel grooved lines. The notched slabs were arranged randomly with no particular attention paid to the direction of the notches in them (some ran north–south and others, east–west), and it therefore seems that they were installed here in secondary use. The level of Stone Pavement 10014 was c. 0.15 m higher than the bottom of the pool (L10022; no excavation was conducted below the pavement in Pool 9008). Four sixth-century Byzantine coins discovered below these paving stones (the latest coin minted in 594/595 CE) indicate the coins were sealed there in the late sixth century or later. A later plaster floor was preserved above the paving stones, and soil and collapsed stones that included fragments of pottery vessels from the Umayyad period accumulated above the plaster floor. In this phase, a channel was built inside Room 22 that crossed the room diagonally toward a narrow window-like opening in W2201. It is possible that this channel conveyed water from the reservoir in Room 112, by way of Room 22, to the later Roman Building E/F, where latrines were previously discovered and which may have been part of a bathhouse. A new plaster floor that sealed beneath it the openings of the ancient lead pipes related to the fountain inside Reservoir 112 was installed during this phase or slightly earlier. In Room 22, soil accumulated to a height of 3 m above the level of the channel (L22014), and fragments of contemporary pottery vessels were found inside it. Abu Riya R. 1992. Jerusalem—Street of the Chain (A). ESI 10:134–135. Bahat D. 2013. The Jerusalem Western Wall Tunnel. Jerusalem. Ben-Dov M. 1982. 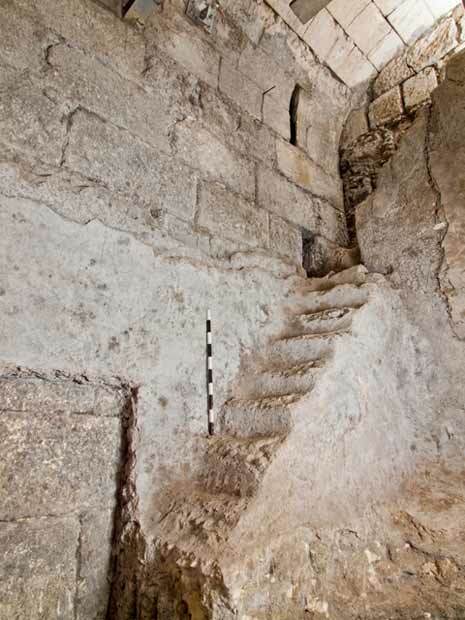 In the Shadow of the Temple: The Discovery of Ancient Jerusalem. Jerusalem (Hebrew). Gershuny L. 1992. Jerusalem, Street of the Chain (B). ESI 10:135–136. Glaser F. 2000. Fountains and Nymphaea. In O. Wikander ed. Technology and Change in History 2: Handbook of Ancient Water Technology. Leiden–Boston–Koln. Pp. 413–451. Hamilton R.W. 1933. Street Levels in the Tyropoeon Valley II. QDAP 2:34–40. Kogan-Zehavi E. 1997. Jerusalem, Hashalshelet Street, 1992 and 1993 Seasons. ESI 16:104–106. Onn A. and Weksler-Bdolah S. 2011. A Monument (Nympheon?) and Other Remains from the Second Temple Period West of the Temple Mount: The Excavations of the Giant Causeway 2010–2011. InD. Amit, G.D. Stiebel and O. Peleg-Barkat eds. New Studies in the Archaeology of Jerusalem and its Region: Collected Papers 5. Jerusalem. Pp. 187–199 (Hebrew). Onn A., Weksler-Bdolah S. and Bar-Nathan R. 2011. Jerusalem, The Old City, Wilson’s Arch and the Great Causeway. HA-ESI 123. Onn A, Weksler-Bdolah S. and Patrich J. 2016. A Herodian Triclinium with a Fountain along the Road Leading to the Temple Mount. Qadmoniot 151:39–48 (Hebrew). Patrich J. and Weksler-Bdolah S. 2016. The “Free Masons Hall”: A Composite Herodian Triclinium and Fountain to the West of the Temple Mount. In G.D. Stiebel, J. Uziel, K. Cytryn-Silverman, A. Re'em and Y.Gadot eds. New Studies in the Archaeology of Jerusalem and its Region: Collected Papers 10. Jerusalem. Pp. 15*–38*. Stiebel G.D. 2013. "The Κρηνη of Jerusalem": A Herodian Nymphaeum at Jerusalem. In G.D. Stiebel, O. Peleg-Barkat, D. Ben-Ami, S. Weksler-Bdolah and Y.Gadot eds. New Studies in the Archaeology of Jerusalem and its Region: Collected Papers 7. Jerusalem. Pp. 148–158 (Hebrew). Stinespring W.F. 1967. Wilson’s Arch and the Masonic Hall, Summer 1966. BA 30:27–31. Warren C. and Conder C.R. 1884. The Survey of Western Palestine III: Jerusalem. London. Pp. 193–209. Weksler-Bdolah S. 2014. The Environs of the Temple Mount between its Destruction in 70 CE and Madaba Map: The Archaeological Evidence from Southeastern Jerusalem. In G.D. Stiebel, O. Peleg-Barkat, D. Ben-Ami and Y. Gadot eds. New Studies in the Archaeology of Jerusalem and its Region: Collected Papers 8. Jerusalem. Pp. 190–209 (Hebrew). Wilson C.W. 1880. The Masonry of the Haram Wall. PEQ 12:21–30. 2. Wilson’s Arch, the Great Causeway and the monumental building from the excavations of A. Onn, general plan. 3. The remains from the Roman period in the vicinity of Wilson’s Arch, plan. 4. Foundation Wall 5006 and Monumental Building B, and the vaults of the Great Causeway above them—10 North (10N) and 10 South (10S), and to their south—the Secret Passage (13), looking east; section. 5. Wilson’s Arch (20), the monumental building (21–23) and the vaults of the Great Causeway above them, looking north; section. 6. Room 22, Wall 2203, looking north; section. 7. 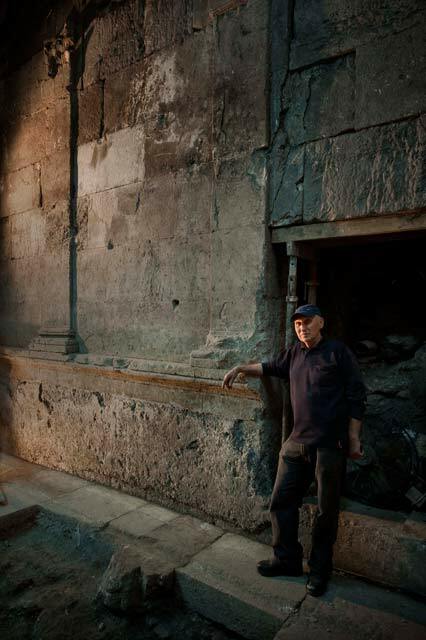 Room 22, Wall 2203, A. Onn stands on the floor of the room and behind him—a later opening in the fountain wall, looking northwest. 8. Room 22, the fountain wall (W2203), looking northwest. 9. Room 22, the northeastern corner, a Corinthian capital of an engaged pilaster, looking northeast. 10. Reservoir 112, a staircase built in the northeastern corner of the reservoir, looking northeast. 11. Wall 2203, an engraving on the wall marking the outline of Vault 2202 prior to its construction, looking north. 12. Vault 10 (North) of the Great Causeway; on the floor of the room is a stone slab pavement (L10014; Stratum 7), looking northwest.